Growing numbers of people are rediscovering their love for the Goddess. At first, this love may seem to be no more than an inner feeling. But soon it develops; it becomes a longing to help the Goddess actively in the manifestation of Her divine plan. Thus, one hears such enquiries as, “How can I get initiated into the Mysteries of the Goddess? How can I experience a closer communion with her? Where are her nearest temples and devotees? “How can I join the priesthood of the Goddess?”, and many other similar questions. The Fellowship believes in the promotion of Love, Beauty and Abundance. No encouragement is given to asceticism. The Fellowship seeks to develop friendliness, psychic gifts, happiness, and compassion for all life. The Druid Clan of Dana develops Nature’s psychic gifts. Iseum’s are the very Hearths of the Goddess, or Goddess and God to Whom they are dedicated. These are listed, along with Lyceums, in every Isian News. Tara Priories and Dana Groves are also listed regularly. All these centers and Isian News are for FOI members only. The Archpriesthood Union is over-all Custodian for the Fellowship. The Fellowship of Isis Priesthood is derived from a hereditary line of the Robertson from Ancient Egypt. Priestesses, priests, every member, have equal honor. 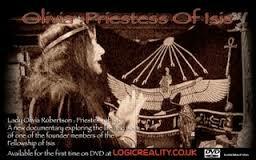 Priestesses and Priests work with the Goddess – or Goddess and God – of their own Faith. Every human, animal, bird, tree is an eternal offspring of the Mother Goddess’s Divine Family of Life. 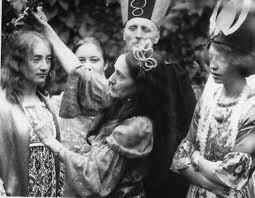 Olivia Robertson, who has died aged 96, was the co-founder, archpriestess and hierophant of the Fellowship of Isis, an order devoted to the worship of the “Divine Feminine”, which she ran from her haunted ancestral pile, Huntington Castle (also known as Clonegal Castle), in Co Carlow, Ireland. A member of an old Irish Ascendancy family, Olivia Robertson had immersed herself in psychic and spiritualist studies from an early age, and had become convinced that God was a “She” after a series of visions. About the first of these — which occurred when she was 29 – she was evasive, explaining that describing the experience to a non-mystic was like “trying to explain colour to someone born blind or a symphony to someone who’s deaf”. Whatever the details, the experience convinced her that she was “clairaudient, clairvoyant and telepathic” and set her on a religious quest. By coincidence, around the same time that Olivia had her realisation, her brother, Lawrence “Derry” Durdin-Robertson, “21st baron of Strathloch”, an ordained clergyman in the Church of Ireland, had also become convinced that God was a woman. An honourable man, he at once proffered his resignation to his bishop, who assured him that “there was no need”. In 1976 Olivia, Lawrence and Lawrence’s wife, Pamela, set up the Fellowship as a movement to worship “Isis of the 10,000 Names” . “At the end of an Aeon and the beginning of the space age, the Goddess Isis is manifesting as the feminine expression of divinity,” Olivia declared. Huntington Castle was the ideal headquarters. 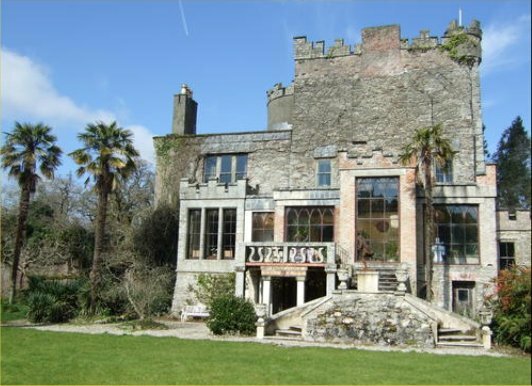 Built as a garrison in 1625 on the site of a 14th-century abbey, Huntington became the seat of the Esmonde family, ancestors of the Robertsons. 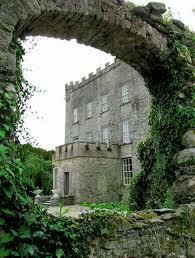 A rambling, castellated pile, complete with suits of armour and the heads of an array of wild beasts (including a crocodile shot by Olivia’s mother), it soon attracted a following of what Olivia called “ordinary Irish psychics”. Running out of room upstairs, she and Lawrence created an underground temple in the castle dungeons, with 12 shrines (one for each sign of the zodiac) and five chapels (each consecrated to a different goddess). There Olivia and her brother would perform elaborate rituals (with an extempore liturgy described by one witness as “the kind of thing you sit through at weddings when couples insist on writing their own vows”), he in blue robes, crook and tall blue hat, she in fetching pink, glittering golden or multicoloured gowns, her wild mane of dyed black hair topped with a brass coronet; she also brandished a sacred “sistrum” — a rattle made of small cymbals set in a wooden frame. It no doubt helped that the strange happenings at the castle began to attract curious tourists to the village, as well as bands of New Age spiritualists who, several times a year, converged on the castle to pray, meditate and perform in pagan dramas and tableaux. Visitors included Van Morrison, Hugh Grant and Mick Jagger, while Brigitte Bardot’s sister made two stuffed canvas dragons for the temple. 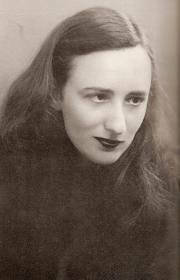 One of four children, Olivia Melian Robertson was born in London on Friday April 13 1917. Her father, Manning Durdin-Robertson, was an architect and a member of a distinguished Anglo-Irish family with estates in Ireland; her mother, Nora, was the daughter of Lt-Gen Sir Lawrence Parsons, a cadet of the family of the Earls of Rosse who, disappointed that she was not a son, brought her up as a boy; she shot big game, invented a fishing fly known as the Black Maria, and wrote a book of memoirs, Crowned Harp. Family ancestors were said to include Scota, legendary queen of the Scots, and Cesara (also known as “Mrs Benson”), a niece of Noah who, watching the Ark sail past from the top of Mount Leinster, called to Noah: “It’s a soft day.” Other notables to whom the Robertsons claimed to be related included Grace O’Malley, known in Irish folklore as Grainne Mhaoil, hereditary queen of Connaught; and the Wicked Lord Rosse, founder of the infamous Hellfire Club outside Dublin, where he and his fellow clubpersons were said to have roasted his butler. Surrounded by literature and paintings, antique-filled interiors, and plenty of parlour spirituality, the children were able to give full vent to their imaginations. Visitors to the house included Robert Graves, WB Yeats and the nationalist mystic George Russell (or, as he liked to be known, “Æ”). Olivia remembered Maud Gonne striding around the castle like “a statue of the goddess Demeter”, but was less impressed by Æ who “just sat there and spoke about skyscrapers”. Olivia was educated at Heathfield School, Ascot, and the Grosvenor School of Modern Art. Following the outbreak of the Second World War, she served briefly as a VAD nurse in Bedfordshire before returning to Ireland, where she enrolled at University College Dublin to study Art History. After the war she did social work with families in Dublin tenements, work which inspired her to write her first book, St Malachy’s Court. She went on to write five more books, one of which — a novel, Field Of The Stranger — won the London Book Society Choice award. She also had some success as a painter: she had her first exhibition in 1938, aged 21, and would later adorn the Temple of Isis with her own visionary work. As an Archpriestess of the Fellowship of Isis, Olivia Robertson travelled to distant temples around the world. In 1993, when the Parliament of World Religions met in Chicago, she was chosen as the representative of “neopagans” and walked in procession at the opening ceremony alongside Chicago’s Roman Catholic Cardinal Joseph Bernardin. Olivia Robertson never married. Her brother Lawrence made his “transition to spirit” in 1994. Announcing her death, the Fellowship of Isis website enjoined the Goddess Isis of 10,000 Names to “bless and keep her as she makes her journey into the next Spiral of the Cosmic Web”. Posted on September 16, 2015 by Q.
Olivia Durdin Robertson, the self-styled “high priestess” of a Co Carlow-based cult devoted to an ancient Egyptian goddess, has died aged 96. Ms Durdin Robertson came to international attention in the 1970s when she co-founded the “Fellowship of Isis” with her late brother Lawrence Alexander Durdin Robertson – a former Anglican clergyman – and his wife Pamela. Huntington Castle She lived with her extended family in Huntington Castle in the village of Clonegal on the Carlow-Wexford border. Her nephew David Durdin Robertson, a craftsman and sculptor who predeceased her in 2009, created an Egyptian temple for her in the dungeons of the castle. In recent years this has been opened to the public for tours at Halloween. Alexander Durdin Robertson said his great-aunt had died on Thursday in Wexford General Hospital following a short illness. He said the fellowship had “20,000 to 30,000” members worldwide. A pre-planned auction of architectural salvage items in Huntington Castle scheduled for Monday will go ahead. Posted on November 15, 2013 by Q.
via Olivia Robertson Has Died.